The finding by Mitchell A. Pavao-Zuckerman, an assistant professor from the University of Maryland's College of Agriculture and Natural Resources, and colleagues from the University of Arizona, University of Madison-Wisconsin, and the Nevada Center of Excellence appears to contradict previous theoretical work and modeling studies predicting solar power installations would decrease temperatures around them by intercepting some of the sun's potentially warming energy and converting it into electricity. "The understanding of energy balance - how heat moves in and out of ecosystems that change from natural to built settings is a big game changer for the future. Consider how PV [solar] panels absorb and reflect certain types of radiation which prevents the soil beneath from cooling like it would under a regular night sky," said Pavao-Zuckerman. "With this knowledge at our fingertips, we can mitigate environmental impacts by creating novel systems to make PV power plants work more efficiently and produce other co-benefits." a photovoltaic (PV) power plant. Prior studies on the "heat island" effect of solar power installations have been confined to just one biome or ecosystem. The result demonstrates that there are potential heat costs to generating green power although the added heat dissipates quickly and can't be measured 100 feet away from the power plants. Considering the external costs of solar power, the discovery of this heat island effect may affect future decisions on when and where to convert natural ecosystems into large-scale solar facilities. Pavao-Zuckerman, lead author Greg Barron-Gafford of the University of Arizona School of Geography and Development, and their research colleagues recently published their findings in the journal Nature Scientific Reports in a paper titled "The Photovoltaic Heat Island Effect: Larger solar power plants increase local temperatures." I've warned about this for a long time. The reflective surfaces of solar farms shoot sunlight back into the air and can prevent clouds from forming or dissipate clouds that are there and superheat dust overhead. They can also cause a massive disparity between the temperature of the air and the temperature of the ground. But "science" devotees called it crazy because "science" told them to believe it wouldn't happen and they don't think for themselves. I also warned that, among other things, windmill farms would prevent the moving air from doing as much work as it normally would, like equalizing temperature over large areas. And, now, they say land downwind of windmill farms is warmer than it would be without them. And, if you believe effects are as small as they're trying to say, you are taking a major risk. what proof do you have of it's factual nature other than your faith that it must be true? so, you want us to believe you without evidence, but you don't want us to believe the evidence without your approval? but you can't see the problem with that? "Findings demonstrated that temperatures around a solar power plant were 5.4-7.2 °F (3-4 °C) warmer than nearby wildlands." "...natural ecosystems into large-scale solar facilities." Just carbon-free nuclear power can stop global warming, it is compact and energy dense, and does not disturb natural ecosystems so intensively as wind/solar does. Since light reflected from solar panels is intended to produce heat, how can that not heat anything it contacts, including clouds and dust? Is it untested that pumping heat into something makes it hotter? And, remember, in converting wind to electricity, windmill farms are effectively taking some energy from the moving air. That decreases the movement of the air, that lowers the effectiveness of the wind, and that lowers the effect of the moving air. Is Captain Stumpy denying conservation of energy? And, note, what I said was legitimate because it's all happening. And, note, what "science" said was so much drivel since the article itself admits that "science's" "models" and "projections" didn't account for this. How valid, reliable, trustworthy can "science" be if it didn't realize this would happen? The liars, like Captain Stumpy, are so maniacally devoted to promoting the lie and opposing the truth that they will even deny what they acknowledge. Solar panels are black in the infrared region. They absorb light - that's how they work. The panels themselves heat up and warm the ground and air around them, and then retain the heat in the shade of the panels during the night when it would normally radiate into the open sky. The ground underneath the solar farm would normally be more reflective - the panels make it darker. You got the reason for the heat island effect completely backwards, which is why people called you crazy, and still do. Is Captain Stumpy denying conservation of energy? i also made it very clear that what your claims are, at best, are considered "untested claims"... per the definition "Vague, ambiguous, or incomplete claim OR factual claim for which evidence is yet unavailable"
and again, this is called a "false claim", or, "Statement about the real world refuted by the evidence"
cite: Barron-Gafford, G. A. et al. The Photovoltaic Heat Island Effect: Larger solar power plants increase local temperatures. Sci. Rep. 6, 35070; doi: 10.1038/srep35070 (2016). I've thought that the best place for moderate sized solar arrays would be on roof tops and over parking areas of large facilities, but it seems that their parking lot heated more with the solar array. I guess asphalt can dissipate a lot of heat into the ground, reducing the effect. Still, how harmful is this?? The heat does dissipate and the reduction in emitted carbon reduces heat trapping effects of atmospheric carbon. The excess heat is also something that can be looked at in future designs in terms of trapping more IR or mitigating the effect. A friend returned recently from Vermont and said there were solar arrays all over the place in fields (with goats on the ground keeping the plants in check.) I image a little extra heat would be good in the winter to help keep the panels clear. I've thought that the best place for moderate sized solar arrays would be on roof tops and over parking areas of large facilities, but it seems that their parking lot heated more with the solar array. In my opinion and from a greedy personal view, I couldn't care less what the local air temperature around my car is. I care what the temperature of the car will be when I get into it. Solar panels will create shade. A car in the shade will be much cooler inside than a car in direct sunlight. So what if it's even 5 degrees hotter around the car. It's still 40-60 degrees cooler inside the car. Okay... so these make waste heat, and all that waste heat is dumped into the atmosphere. Suddenly this is a concern? How about the heat every other source pumps into the atmosphere? Coal, oil, natural gas, nuclear... all these sources of power make power by boiling water and passing the steam through a turbine. They aren't very efficient and most of the wasted energy produced is dumped into the local atmosphere as waste heat. Then, with many of those, much of the heat starts being trapped in the atmosphere by greenhouse gasses. Even hydroelectric will be producing some waste heat. Churning of water through a hydroelectric dam produces a lot of friction and that will warm the water. Slowing rivers and streams also allows them to warm before they make ti to the oceans. Why aren't any other power production methods held to any of the rigorous criticism of solar? The summary here is misleading. The headline 3-4 degree warming is the air temperature at midnight. Warming at noon was trivial, under 0.5 degrees C. The average must be about half the peak. The researchers did not measure ground temperatures at all. You would expect these to show a decrease at noon from shading, and an increase at night from radiation blocking and convection. Is evaporation proportional to temperature, or non-linear? If the latter, the net effect on evaporation could be a reduction. The panes create a different environment for plants and animals. It should now be possible to measure the effects on both directly, on farms that have taken trouble to disturb the soil and vegetation as little as possible. Commentators jumping to conclusions and pushing an agenda again. No form of energy is without problems. 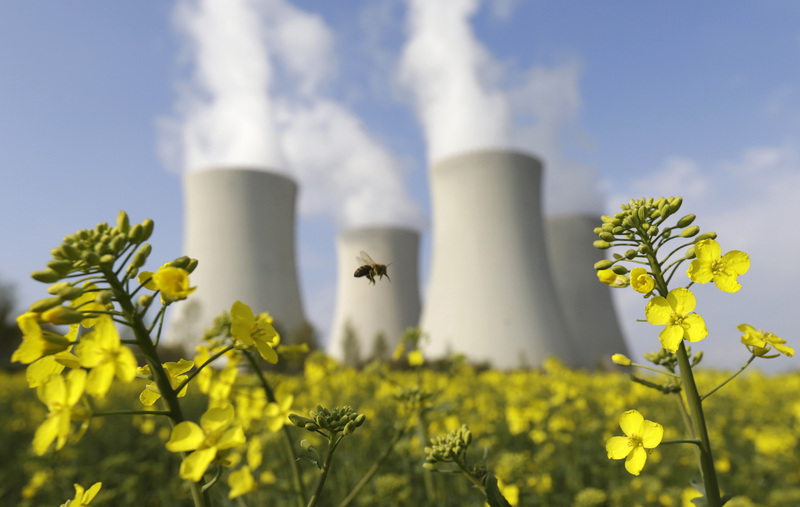 Nuclear is carbon neutral, but do you want the waste in your back yard? How about we bury it on native land and end up with another Standing Rock types mess. Want energy? You will change something for someone (or something) but you have to look at the bigger picture. Ultimately we need to turn solar energy directly into electricity, but the innovations required to do that efficiently and sustainably are not within our reach at this point. Does that mean we stop? Do we simply mine, mine, mine good old-fashioned coal? Progress is not without problems, but still we must proceed. Nuclear is carbon neutral, but do you want the waste in your back yard? "Most of the waste .. require a storage time of less than 300 years .. less than 1% is radioactive for 10,000 years. This portion is not much more radioactive than some things found in nature, and can be easily shielded to protect humans and wildlife." "One person's lifetime nuclear waste would fit in a Coke can — which is tiny, compared with the many tons of carbon dioxide the average American dumps into the atmosphere each and every year." The worst heat producers are those plants which are inefficient thermally, such as nuclear plants, the worst of all of them, putting almost four times the energy into the local atmosphere or water than power on the line. Then, there are Fukushima, Chernobyl, and the failure to find ways to even store the nasty dangerous high-level nuclear waste. Can we send it to the nuke promoters such as Willie? An interesting fact: "The carbon industries know that nuclear power will mean their demise, so they never speak ill of wind or solar." So it is easy to conclude that renewables(politically/ideologically(unicorn-fart-energy)) and fossil fuels(reliable baseload) are best friends against carbon-free nuclear power. "..30 percent capacity factor..wind and solar..both rely on coal or gas to provide 70 percent of their rated power"
"three issues must concern us: carbon emissions, carbon footprint and ecological footprint. But the renewables-only policy worsens all three"
"90 percent efficient nuclear generators that operate 24/7 but, paradoxically, get no compensation for being carbon-free"
"Natural gas companies love renewables and supports environmentalists efforts to close nuclear power"
If Willie is answering me, probably with more copy-and-paste, he is wasting his time. He is on Ignore, which is why I do not rate his silly stuff. Perhaps he can discuss the relative local heat problems with PV and nukes? And, I wonder, . . which technology now needs greater subsidies, even after being completely paid off, and which ones are taking over, paying for themselves as they produce cheaper, cleaner power? I see I am still on the automatic hit-list of "Ira". Rage votes. I was hoping he would have outgrown that. I guess you cannot predict what happens in Trump Country, Louisiana. Those are the evangelicals who inflicted the Pu$$y-grabber on us. He is on Ignore, which is why I do not rate his silly stuff. gskam is a funny, crazy, sociopath, pathetic pathological fibber, that prefers to ignore the reality in order to stay stuck believing in his own lies: a world 100% powered by unicorn fart energy. Not a rage vote. It is a vote for a stupid comment, just like the one you just posted. It gets the one vote because you are carrying on a conversation with a person that you are claiming you are ignoring. What does ignore mean out there in California? This one gets the one vote because I did not vote for Trump. But it don't really matter whether I vote for Trump Clinton or Micky Mouse. If you are having the conversation while telling us the person is on ignore,,,,, you get a one karma point for being stupid (or stoned). You admitted you automatically award a one vote to me, no matter the post. Thanks for Trump, Mister Red State. Now, let's get back to solar heat islands, like we have here in the west, unlike the extreme thermal islands and plumes created by nukes and coal plants. Then, . . there are the toxic waste problems, . . . .
Notice how gskam is completely divorced from the reality, he thinks that just unicorn fart energy(wind&solar) is enough to power the whole world and that fossil fuels are unnecessary as backup to compensate intermittencies. Fossil fuel barons love this kind of guy. That's why you are the object of ridicule and derision Cher. I voted for Clinton, so saying that is just plain goofy and dumb. Is it supposed to hurt my feelings or bother me? It would have to be true for that to happen. Skippy, you are the single most stupid person on the physorg and fun because you think you are smartest. Any solar island effect is dwarfed, made insignificant by the thermal plumes of a nuclear powerplant such as Grand Gulf, which dumps 3-4 times as much energy into the cooling water and local environment as it puts online as electricity. Lets discuss the thermal effects of PV or solar thermal versus combustion or nuclear plants, shall we? White objects reflect light while black objects absorb light and irradiate it as heat into environment. Solar PV is a black object that converts light at 15% efficiency, so 85%(much more than two-thirds) is dumped into environment as waste heat. It is worse because solar farms take large areas in natural ecosystems. "Lets discuss the thermal effects of PV or solar thermal versus combustion or nuclear plants, shall we?" What are those thermal effects? Well, let's see, . . the sunlight which falls on the nuclear reservation, the land and facilities, turns almost all to heart. The energy falling on a solar farm uses some of it to produce work before it turns to heat. But the intense heat (3,000,000 degree Neutrons), of nuclear madness causes terrific trouble, and the Neutrons eventually transform the metal of the reactor vessel itself, turning it brittle. Now, let's get to the waste, Willie and the rest. How much do you want? ..the intense heat (3,000,000 degree Neutrons)..
the intense heat is confined in a small area(reactor core) while the waste heat from nasty solar panels are spread to entire ecosystems causing thermal impact on wildlife health, aside disruption of natural habitats. I can't see Willie's response. Then why are you asking him questions? What difference does it make? You can't see his response so you think we are supposed to read them to you? Cher you some kind of mental conditions, I tell you true. Alzheimer's disease is considered part of the brain aging process. gskam should seek urgently the help of a psychologist or psychiatrist to get mental treatment. Go look up how much power was delivered by your favorite Nuclear powerplant last year, and multiply that by three or more to see how much thermal pollution was put into the local environment. And it is intermittent, for refueling and turbine trips and other activities, so the local biota do not have a chance to adapt to it. Then, we have the waste, . . . don't we? It's exothermic, too, and for a long time. This thread regards heat islands from power sources. Nuclear powerplants are the worst. Coal is next. "all "renewables" require oil, coal, or gas to make up for more energy than they deliver." "Nuclear power is one of the chief long-term hopes for conservation ... Cheap energy in unlimited quantities is one of the chief factors in allowing a large rapidly growing population to preserve wildlands, open space, and lands of high scenic value ... With energy we can afford the luxury of setting aside lands from productive uses." And why try to build nuclear plants when the examples at Hinkley point and other spots shows us they need huge investments, subsidies, a nuclear priesthood to run them, and a police state to guard them and their leavings? Nukes are SO 20th Century. Windmills are so dark ages. "Advanced Fast Neutron Reactors (AFR) are fast breeder reactors that can use nuclear "waste" for fuel — the spent nuclear fuel that has been discarded from conventional nuclear plants can power AFR's, producing clean electricity while destroying radioactive waste." "Advanced nuclear plants have uniquely high capacity factors of 90% and above and are the dispatchable sources of energy that can be utilized on demand..."
"Modern reactor technology has advanced so that we can re-use waste stockpiles and old warheads to produce clean electricity for hundreds of years without mining more uranium." We'd probably have SOHO nuclear if it didn't pose so many different issues to State and environmental security. That much energy independence scares some people. One thing that solar power and wind offer that fossil fuels and nuclear don't is the practical possibility for individuals and communities to disconnect completely from commercial energy vendors - and from conventional non-renewable and unsustainable energy sources in general. However, going fully renewable requires more than solar panels, batteries, and inverters. It also requires a change of lifestyle. We live in a world where plastic consumer products, made from fossil fuel petroleum at a cost of significant additional energy, are routinely bulldozed into landfills. And yet only recently Japanese inventor Akinori Ito created his portable "Blest" machine, a pressure vessel that uses pyrolysis to convert waste plastics back into oil. We are surrounded by energy resources that we have only just begun to learn to harvest. Anybody who has had a plastics injection molding machine stick closed has already turned the plastics back to oil. No trick involved. I was being facetious. All thermoplastics of which I am aware will return to oil under heat. It is not new, it has just become potentially practical due to the need and technology for recycling. The boats which harvest plastics from the seas could burn it in a boiler of liquify it and use it in a turbine. So - you lost this job for screwing up a plastics injection molding machine. Or was it just general incompetence and lying about your education and experience like you do here? You know, the same reason you lost the other 12-14++ jobs? Can we rid this forum of the adolescent games by otto? Stop talking about yourself and we wont know what a loser you are. OOp too late.